A blog about running Windows on My MacBook Pro. I am finally retiring my PC laptop and am using a 15" MacBook Pro (320 GB, 2.8GHz, 4GB DDR3 SDRAM) as my main machine. I still need to run Windows (Outlook), so I will using Parallels. 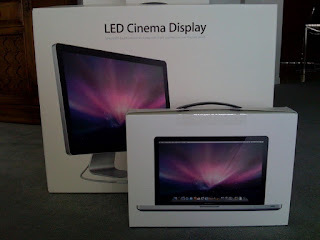 For the office, I bought the Apple LED Cinema Display (24" flat panel). This blog is about my experiences switching from Windows to the Mac. My iPhone 3G is finally upgraded and synched with my Windows iTunes 8.2 running with Parallels 3 on my MacBook Pro. It wasn't easy but I fially figured out that I must run the USB ports in guest mode when synching my iPhone. I will eventually upgrade to Parallels 4, but that will be at a later date. Yes, in 2009, I am retiring my PC laptop and and going to use an Apple MacBook Pro for my main machine. I still need to run Windows since I'm not ready to divorce Microsoft Outlook yet, so I'll be running Parallels. - Apple LED Cinema Display (24" flat panel) for my office. This blog is about my experiences switching from Windows to the Mac. This includes Parallels Coherence Mode, Managing Parallels Devices and Windows Mac File Sharing. It's also about the peripherals and migration issues because my iPhone, iTouch and iPod are now working perfectly fie. I'm a frequent iTunes music purchaser and my music is all stored on my PC laptop. This is my second attempt to switch from a PC to a Mac. Last year to switch to the 13" MacBook, but the screen was just too small. This is an amazing computer. I believe it's the best 15" Apple laptop you can buy! In addition, with the 24" flat panel display for my office, it makes it the "Porsche" or "Ferrari" of computing power and elegance! I am looking forward to using this computer in 2009!